This entry was posted in Just Life on May 28, 2015 by Steve Tilford. of the first new year of breaking my hip. I did it on May 27th, 2014, and although I raced last weekend and that was the unofficial anniversary, if there are anniversaries of injuries, today is day two of year two. I can’t say that I had any idea how big of a deal this was going to be. I looked back at the post I did the night I got hurt, the day of surgery, and I didn’t seem to be too concerned. But, I have been hurt a lot in life and never really think much about it at the time. This time it was a little different. I thought it was going to be a couple months. I did race Chequamegon at 3 1/2 months. I’m not sure how I did that looking back. Stupid determination probably explains it best. Even last week, I was limping around some. It just depends on the day and weather. Honestly, the weather is probably the biggest influence on pain and limping. I can’t really put any other actions, like long rides, jumping a lot, climbing ladders, etc. to it feeling worse. Like I’ve said, I’ve been hurt a lot over the years. Not more than anyone else, probably just average, but considering how long I’ve been at this, it adds up. I’ve only hurt my lower body a couple times. I broke my leg once at the British Milk Race, but that was the fibula, the small bone in the lower leg, and it healed up pretty quickly. Actually, now that I think about it, I fractured my hip in the Tour de France VTT, MTB version of the Tour back in the 90’s. They didn’t do anything with that and it really didn’t slow me down much at all. 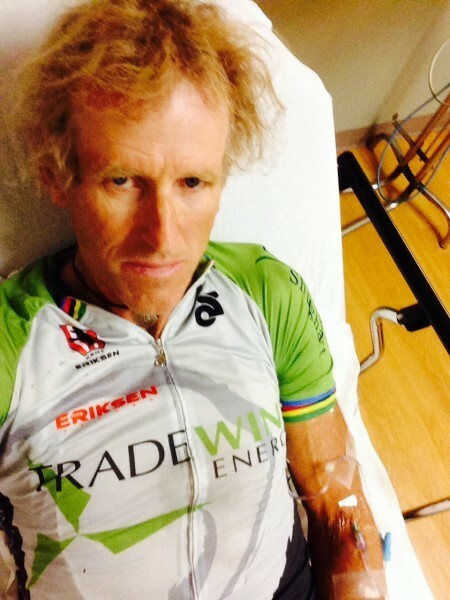 Leg injuries are a problem for cyclists for obvious reasons. Breaking a collarbone, shoulder injuries, etc. are a little easier to get back on the bike from. I have to admit, my right shoulder, the one I had rotator cuff surgery on a couple years ago, has never really worked very well since. But, it’s not really a huge deal riding bikes. In life, it’s a real drag, but riding a bike you usually keep your hands lower than your shoulders. When, or if I get a chance to throw my arms up at the end of a bike race, then the rotator cuff problem might come into play. Tonight I’m racing a time trial in Kansas City, the start of a 3 day weekend. The time trial is only 3 miles. It seems like such a waste of gas and time to do that, but it is part of the omnium and there are even points for the time trial, circuit race and criterium. I have been riding pretty horrible this week training. I think, actually, I know it is allergies. I have all my symptoms of allergies. Ears all clogged, tired, itchy eyes and fatigue. I need to get out of here soon. It is so wet and everything is growing like crazy. Okay, Brian is bringing some of my race wheels by Topeka soon. He is doing the Dirty Kanza tomorrow. I feel bad for him and all those guys racing it tomorrow morning early. It could turn into a real death, like nearly die, death march. It is supposed to rain all day and tonight in Emporia. Some of the roads don’t have any gravel, so they are dirt, ie. mud when you add water. Plus there are a few low water crossings, which won’t be so low if it rains into the night. 200 miles of doing that is going to be mentally and physically trying, to say the least. It isn’t supposed to rain tomorrow in Kansas CIty. That is a good thing because the circuit on Cliff Drive is not a good course wet. It really only has a couple corners that are bad, but they are bad dry, so wet they would be treacherous. Okay, I’ve been rambling enough. Better watch the end of the Giro. Looking all happy at the hospital a year ago. Hey Steve, Its going on 10 yrs. for me and I’m still trying to ride my bike consistently. I was running and was run over by a 3/4 ton truck. Shattered my pelvises, right femur shattered beyond repair, fib and tib shattered. Titanium plates inserted permanently. My most serious injury was head trauma, 200 stiches in my head , plus a blank spot in my memory for about 3 weeks. I spent 3 months in the hospital, one year in bed, another year in a wheel chair. Since then , every time I’d fall on the bike I’d crack my hip, pelvis or femur again and suffer another set back. This last time now its over a year and just ready to start getting core strength back to attempt yet another comeback. Frustrating, but besides raising my children, its what I love the most, like you. As I’ve written to you before saying, keep doing what your doing, there are a lot of people who look to you for your experiences. Lots of omnium racing in the midwest now. I’m not a fan. If you are going to have a stage race have a stage race. Make everyone do all the stages or just have a weekend of good one day races. I’d love to hear your thoughts on it after the weekend Steve. Clearly you’re delusional man. I bet there isn’t one bike racer on earth that’s been in more crashes, had more injuries or injured as many places on their body as you. If I’m wrong and there are some, I’d bet good money there aren’t more than 4 or 5…..on the PLANET! Not tryin’ to hate on you, just speaking what I believe to be the truth…. Thurlow used to bring his arm sling to bike races, so that when he’d break his collarbone, it’d be a more comfy ride home. He’d broken it that many times. Go get ’em this weekend Steve. Pulling for you. Yeah, because regular working people can do stage races regularly. Omniums are becoming popular because they’re great for the vast majority of people who race-people with 9-5 jobs, families, and responsibilities. Why are you “not a fan?” What is it about omniums that bothers you so?